ADAMS COUNTY—Expect various overnight closures on I-25 the week of Sept. 16 as crews make emergency repairs to degrading pavement joints from 104th to 136 avenues. This work is part of the ongoing North I-25 Express Lanes: 120th Avenue to Northwest Parkway/E-470 project. All work is weather permitting and subject to change. Please plan to add 15 to 20 minutes to your travel time to detour around the closures. 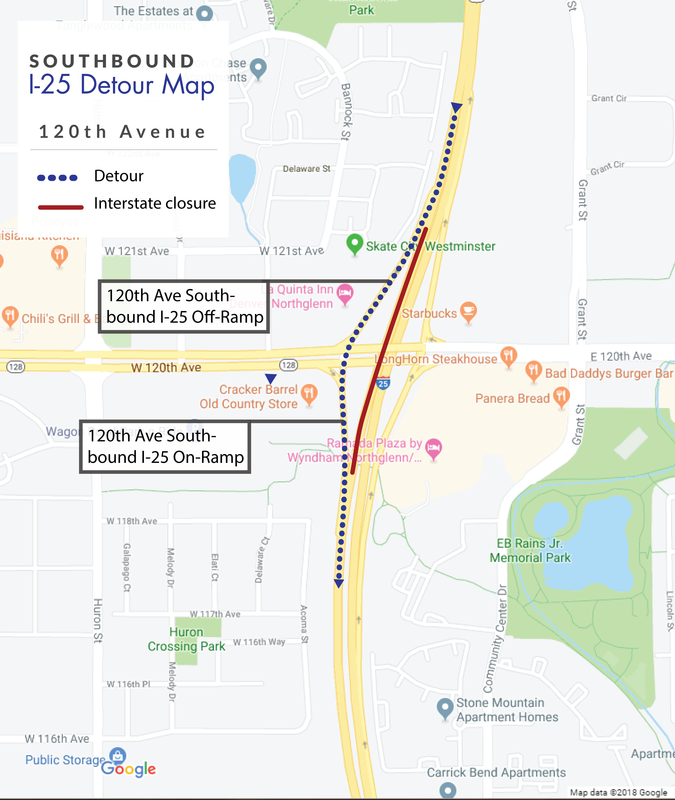 11 p.m. Sunday, Sept. 16 to 5:30 a.m. Monday, Sept. 17 Triple-left-lane closure on southbound I-25 at 120th Avenue Traffic will detour around this closure by exiting at the 120th Avenue off-ramp and reentering southbound I-25 using the 120th Avenue on-ramp. 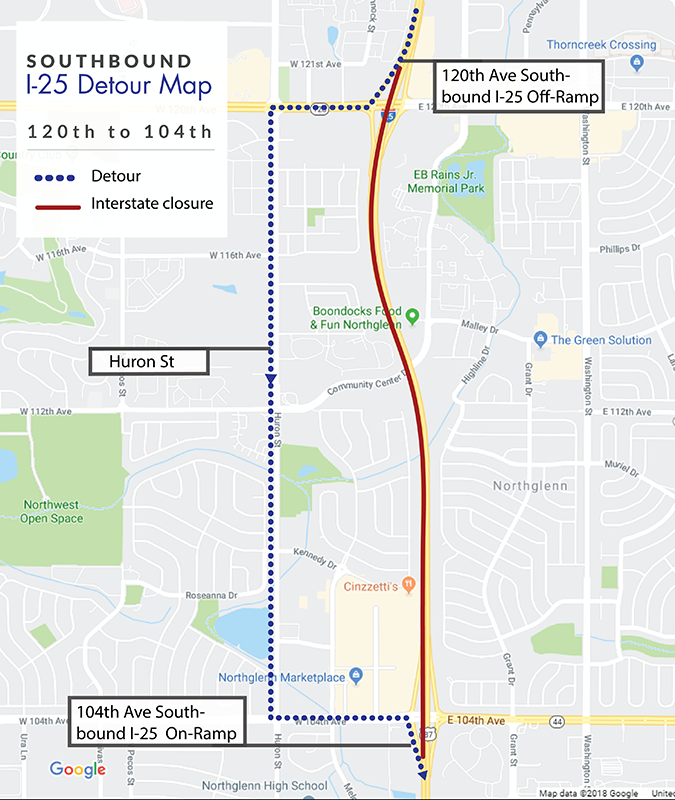 11 p.m. Tuesday, Sept. 18 to 5:30 a.m. Wednesday, Sept. 19 Full closure of southbound I-25 from 120th Avenue to 104th Avenue Exit southbound I-25 at 120th Avenue, travel west to Huron Street, south on Huron Street then east on 104th Avenue to rejoin southbound I-25. 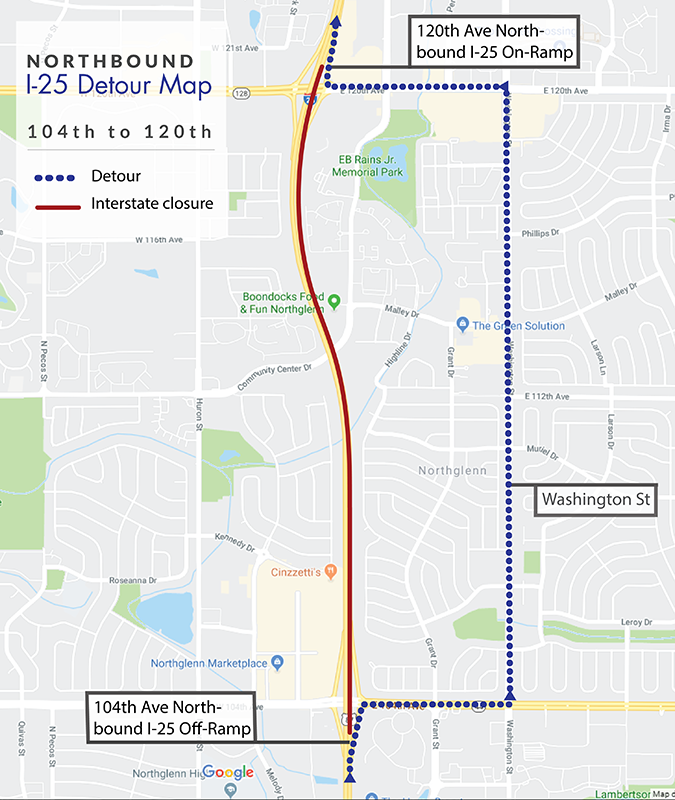 11 p.m. Wednesday, Sept. 19 to 5:30 a.m. Thursday, Sept. 20 Full closure of northbound I-25 from 104th Avenue to 120th Avenue Exit northbound I-25 at 104th Avenue, travel east to Washington Street, north on Washington Street then west on 120th Avenue to rejoin northbound I-25. 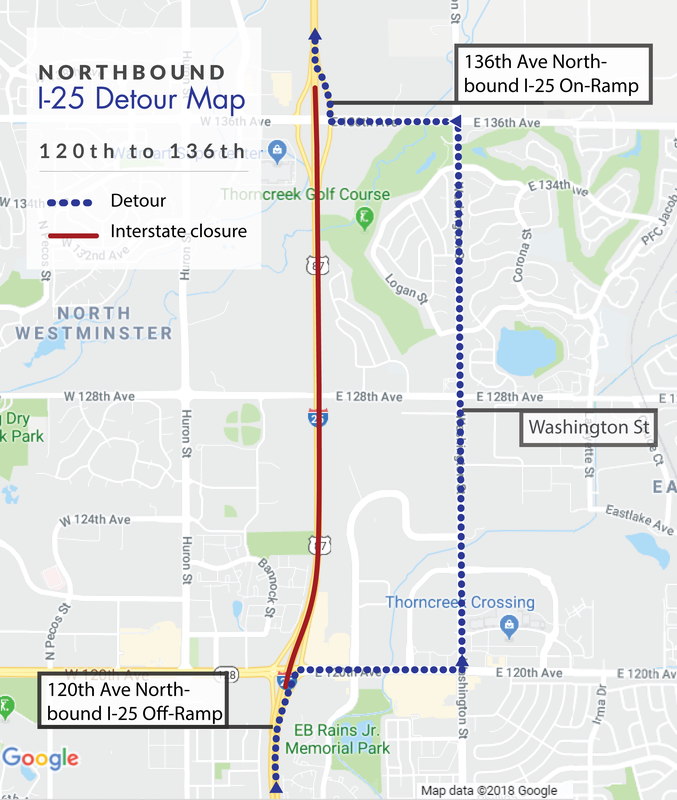 11 p.m. Thursday, Sept. 20 to 5:30 a.m. Friday, Sept. 21 Full closure of northbound I-25 from 120th Avenue to 136th Avenue Exit northbound I-25 at 120th Avenue, travel east to Washington Street, north on Washington Street then east on 136th Avenue to rejoin northbound I-25.